Sabudana is one of my favourite ingredient and I have posted few dishes earlier.To name a few, sabudana pops,sabudana kichdi,sabudana laddoo and today it is Sabudana idli. I had prepared this idli long time back and found it in a folder.There was a time when I used to prepare this idli every now and then….This is a very easy recipe and I love the taste and texture too. This recipe came to my notice when my friend Pallavi Nayak posted it in a group and I got so inspired I prepared it. 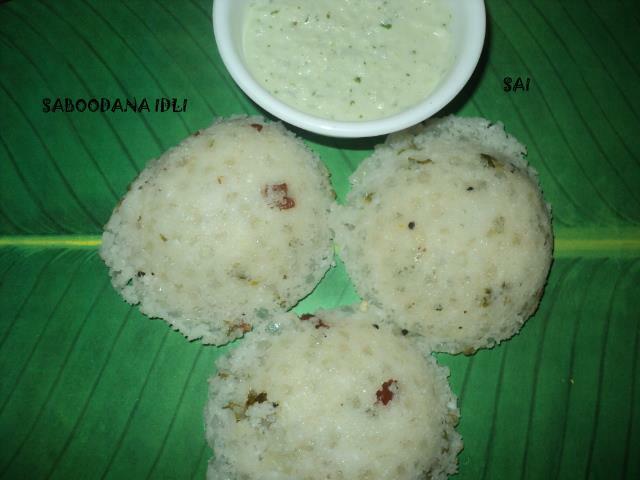 Take a large bowl,mix together idli rawa,sabudana,curds and water. Add salt to taste and keep it outside overnight or 10 hours. Next morning mix it well,add additional water if it has turned dry. Add grated coconut and mix it. You may also divide the batter at this step and refrigerate for further use,but half the tempering part. Heat ghee or oil in a pan,splutter mustard seeds,add curry leaves,cashewnuts and green chillies. Season it to the batter,add baking powder and mix it again. Grease the idli mould and add a ladle of batter and steam it for 20 minutes. To check weather the idlis are cooked you may insert a bamboo skewer,if it comes out clean,then it indicates it is cooked. Cool it for sometime and then unmould it with the help of a butter knife.